Objective To investigate the association between dietary protein sources in early adulthood and risk of breast cancer. Participants 88 803 premenopausal women from the Nurses’ Health Study II who completed a questionnaire on diet in 1991. Main outcome measure Incident cases of invasive breast carcinoma, identified through self report and confirmed by pathology report. Results We documented 2830 cases of breast cancer during 20 years of follow-up. Higher intake of total red meat was associated with an increased risk of breast cancer overall (relative risk 1.22, 95% confidence interval 1.06 to 1.40; Ptrend=0.01, for highest fifth v lowest fifth of intake). However, higher intakes of poultry, fish, eggs, legumes, and nuts were not related to breast cancer overall. When the association was evaluated by menopausal status, higher intake of poultry was associated with a lower risk of breast cancer in postmenopausal women (0.73, 0.58 to 0.91; Ptrend=0.02, for highest fifth v lowest fifth of intake) but not in premenopausal women (0.93, 0.78 to 1.11; Ptrend=0.60, for highest fifth v lowest fifth of intake). In estimating the effects of exchanging different protein sources, substituting one serving/day of legumes for one serving/day of red meat was associated with a 15% lower risk of breast cancer among all women (0.85, 0.73 to 0.98) and a 19% lower risk among premenopausal women (0.81, 0.66 to 0.99). Also, substituting one serving/day of poultry for one serving/day of red meat was associated with a 17% lower risk of breast cancer overall (0.83, 0.72 to 0.96) and a 24% lower risk of postmenopausal breast cancer (0.76, 0.59 to 0.99). Furthermore, substituting one serving/day of combined legumes, nuts, poultry, and fish for one serving/day of red meat was associated with a 14% lower risk of breast cancer overall (0.86, 0.78 to 0.94) and premenopausal breast cancer (0.86, 0.76 to 0.98). Conclusion Higher red meat intake in early adulthood may be a risk factor for breast cancer, and replacing red meat with a combination of legumes, poultry, nuts and fish may reduce the risk of breast cancer. Although breast tumors vary by estrogen and progesterone receptor status, most previous studies have evaluated the relation between dietary sources of protein and breast cancer, with limited information on how the cancers differed by hormone receptor status.5 6 In an early analysis from the Nurses’ Health Study II with 12 years of follow-up,6 we reported a positive association between red meat intake and breast cancer in premenopausal women, especially tumors with positive hormone receptors. However, it was not clear whether the positive findings were due to early age at dietary assessment or the relatively young age of women at diagnosis of breast cancer. In this updated analysis with longer follow-up and approximately three times the number of cases of breast cancer, we investigated the association of total intakes of unprocessed and processed red meat before menopause with risk of breast cancer overall and separately among premenopausal and postmenopausal women. In addition we examined the associations between breast cancer and other protein rich foods, including poultry, fish, eggs, legumes, and nuts. Furthermore, we evaluated whether the association between red meat and breast cancer differs by hormone receptor status. The Nurses’ Health Study II began in 1989 and is a prospective cohort study of 116 430 female registered nurses who were 24 to 43 years of age. In 1991, participants were asked to complete a food frequency questionnaire about usual dietary intake in the past year. A total of 97 813 women answered the questionnaire. We excluded those who had an implausible daily energy intake (<2508 or ≥14630 kJ) or left more than 70 food items blank on the food frequency questionnaire. Of the remaining 95 452, we excluded women who were postmenopausal in 1991. Participants were also excluded if they had a diagnosis of any cancer except non-melanoma skin cancer, diabetes, coronary heart disease, or stroke before returning the 1991 questionnaire, or had missing data on age or red meat intake. We included 88 803 women in the analysis. The cumulative response rate among living participants was 95%. Food intake during adolescence was measured in 1998 using a 124 item food frequency questionnaire, which was specifically designed to contain foods that were usually consumed during the periods from 1960 to 1980 when these women would have been in high school. Food items included in the food frequency questionnaire for adolescents and response categories were similar to those in the food frequency questionnaire for adults. We calculated nutrient intakes by multiplying the frequency of consumption of each item by the nutrient content of the specified portions and then summing across all items. Nutrient values in foods were obtained from the US Department of Agriculture, food manufacturers, independent academic sources, and our own fatty acid analyses of commonly used margarines, cooking oils, and baked foods.15 16 17 Every four years, the food composition database was updated to account for changes in the food supply. We calculated the percentage of energy from total fat by dividing energy intake from total fat by total energy intake. Using the residuals from the regression of nutrient intake on total energy intake, we adjusted total iron and heme iron for energy.18 19 We did not adjust food intakes for total energy intake, as the correlation between individual foods and total energy intake was low. We identified new cases of breast cancers from biennial questionnaires. Then we got permission from women with breast cancer or next of kin for those who had died to review hospital records and pathology reports. Deaths in this cohort were reported through family members and the postal service in response to the follow-up questionnaires or identified through annual review of the national death index. Medical records were obtained for 88% of cases in the Nurses’ Health Study II included in this analysis. More than 98% of self reported breast cancers were confirmed through review of pathology reports. Therefore we included self reported cases with missing pathology reports in the analysis. We excluded cases of carcinoma in situ from the analyses. To determine the estrogen and progesterone receptor status of the breast cancer we abstracted information from pathology reports. We calculated person years from the return date of the 1991 questionnaire until the date of breast cancer diagnosis, death, or end of follow-up (1 June 2011), whichever came first. We used the dietary intake in 1991 in the primary analysis as this represents the dietary intake in early adulthood. Women were divided into five categories according to food group or nutrient intake. We used Cox proportional hazards models, stratified by age in months and questionnaire year, to estimate relative risk and 95% confidence intervals. Multivariable models adjusted for race, family history of breast cancer in mother or sisters, history of benign breast disease, smoking, height, body mass index, age at menarche, parity, age at first birth, oral contraceptive use, and alcohol and energy intakes, and, for postmenopausal women, age at menopause and hormone use. For all women, we additionally adjusted for menopausal status. We replaced missing covariate data, which comprised 5.5% of total person years for oral contraceptive use and less than 5% of total person years for body mass index, smoking, height, age at menarche, age at menopause, parity, and age at first birth, with the carried forward method for continuous variables and missing indicator method for categorical variables. To best represent long term effects of food intake on breast carcinogenesis and to minimize measurement error caused by within person variation, we calculated premenopausal cumulative averaged intakes of food groups using the 1991, 1995, 1999, 2003, and 2007 dietary data for a sensitivity analysis. To evaluate the effects of diet during the premenopausal period on risk of breast cancer, we stopped updating the dietary data when the participants reported change in menopausal status. We used the median value of each variable in each fifth as a continuous variable for tests for trend. We estimated the effect of substituting one serving/day of poultry, fish, legumes, eggs, or nuts for one serving/day of total red meat by including simultaneously these food items as well as low fat dairy products and high fat dairy products as continuous variables in the multivariable model. The relative risk and the 95% confidence intervals for the substitution effect were derived from the difference between the regression coefficients, variances, and covariance.22 We examined effect modification for the association between red meat and breast cancer risk by other measures of breast cancer risk factors. A cross product interaction term between each factor and intake of red meat expressed as a continuous variable was included in the multivariable model. We used a likelihood ratio test with one degree of freedom to derive P values for tests for interactions. We also tested the differential association between total red meat intake and breast cancer risk by estrogen and progesterone receptor status using Cox proportional cause specific hazards regression model with a duplication method for competing risk data. This method permits the estimation of separate associations of red meat with each of positive estrogen and progesterone receptors and negative estrogen and progesterone receptors, and has been used to assess whether red meat intake has statistically different regression coefficients for different tumor subtype. We used SAS version 9.3 (SAS Institute, Cary, NC) for all analyses. All P values are two sided. During 1 725 419 person years of follow-up of 88 803 premenopausal women, 2830 cases of invasive breast carcinoma were documented (1511 premenopausal breast cancer, 918 postmenopausal breast cancer, and 401 uncertain menopausal status) between 1991 and 2011. The average age of the participants in 1991 was 36.4 (SD 4.6) years (range 26-45 years) and the average age of breast cancer diagnosis was 45 years in premenopausal women (range 27-60 years) and 55 years in postmenopausal women (range 39-64 years). Table 1⇓ shows the age adjusted distribution of breast cancer risk factors according to fifths of total red meat intake. Compared with women who consumed a lower amount of red meat, women with a higher intake were more likely to have a larger body mass index, to have higher energy intake, to smoke, and to have three or more children as well as less likely to use oral contraceptives and to have a history of benign breast disease. Among all women, higher total red meat intake in 1991 was associated with an increased risk of breast cancer in multivariable analysis (relative risk 1.22, 95% confidence interval 1.06 to 1.40; Ptrend=0.01, for highest fifth v lowest fifth) (table 2⇓). Similar point estimates were observed among premenopausal and postmenopausal women, separately, though they did not reach statistical significance. Among all women, the positive association between total red meat was still significant after additional adjustment for total fat intake (for highest v lowest fifth: relative risk 1.20, 1.03 to 1.40; Ptrend=0.04), fruits and vegetables intake (for highest v lowest fifth: 1.19, 1.04 to 1.37, Ptrend=0.03), or heme iron (for highest v lowest fifth: 1.21, 1.04 to 1.41; Ptrend=0.03). We also controlled for the frequency of having fried foods at home and away from home, but the results were not appreciably altered (data not shown). When total red meat intake was modeled as a continuous variable, each additional serving/day increase in total red meat was associated with a 13% increase in risk of breast cancer among all women (relative risk 1.13, 1.04 to 1.22), 12% increase among premenopausal women (1.12, 1.01 to 1.25), and 8% increase among postmenopausal women (1.08, 0.94 to 1.23). Additional adjustment for red meat intake during adolescence did not appreciably attenuate the relative risk. Among women with dietary data for both adulthood and adolescence (n=40 644), the relative risk for one serving/day of total red meat intake during adulthood was 1.20 (1.07 to 1.34) for breast cancer overall and 1.24 (1.07 to 1.44) for premenopausal breast cancer. After additional adjustment for red meat intake during adolescence, the relative risk was 1.18 (1.06 to 1.33) for breast cancer overall and 1.20 (1.03 to 1.40) for premenopausal breast cancer. In a sensitivity analysis using the cumulative average of premenopausal intake, similar results have been found (for each additional serving/day: relative risk among all women 1.12, 1.03 to 1.22 and among premenopausal women 1.15, 1.02 to 1.29). Poultry intake in 1991 was associated with a lower risk of postmenopausal breast cancer (highest v lowest fifth: relative risk 0.73, 0.58 to 0.91; Ptrend=0.02) (table 2⇑), and the estimate was unchanged with adjustment for fat or fruits and vegetables intakes (data not shown). Also, cumulative average of premenopausal intake of poultry was associated with a lower risk of postmenopausal breast cancer: each additional serving/day of poultry was associated with a 25% lower risk of postmenopausal breast cancer (relative risk 0.75, 0.58 to 0.98). Neither baseline intakes of poultry, nor the cumulative average of premenopausal poultry intakes, were associated with premenopausal risk of breast cancer. 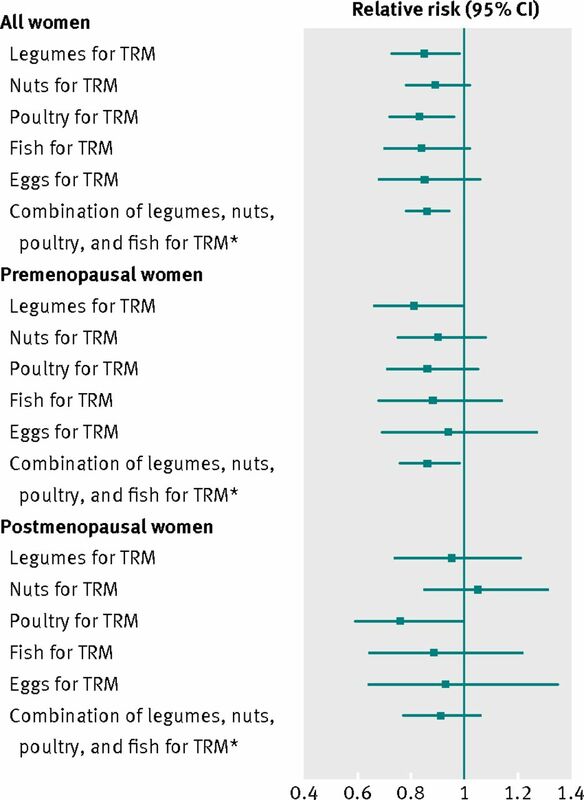 Intakes of legumes, fish, eggs, and nuts were not associated with either premenopausal or postmenopausal breast cancer (tables 2 and 3⇓). In age adjusted and multivariable adjusted models, none of the tests for trend were significant across fifths of total iron and heme iron intakes in early adulthood and breast cancer incidence in either premenopausal or postmenopausal women (see supplementary table S1). Based on diet in 1991, substituting one serving/day of legumes for one serving/day of total red meat was associated with a lower risk of breast cancer among all women (relative risk 0.85, 0.73 to 0.98) and among premenopausal women (0.81, 0.66 to 0.99; figure⇓). Replacement of one serving/day of total red meat with one serving/day of poultry was associated with a lower risk of breast cancer in all women (0.83, 0.72 to 0.96) and postmenopausal women (0.76, 0.59 to 0.99). Furthermore, substituting one serving/day of combined legumes, nuts, poultry, and fish for one serving/day of red meat was associated with a 14% lower risk of breast cancer overall (0.86, 0.78 to 0.94) and a 14% lower risk of premenopausal breast cancer (0.86, 0.76 to 0.98, figure). We had information on estrogen receptor status for 81% (n=2306) of breast cancers and progesterone receptor status for 80% (n=2275) of breast cancers. Supplementary table S2 presents the associations between total red meat intake and breast cancer risk according to hormone receptor status; data are presented for both tumors with positive estrogen and progesterone receptors and tumors with negative estrogen and progesterone receptors. We did not observe significant heterogeneity between total red meat intake and tumor status in either premenopausal or postmenopausal breast cancer (see supplementary table S2). We also examined whether the association between intake of red meat and breast cancer risk differed by levels of risk factors for breast cancer, including family history of breast cancer, body mass index, oral contraceptive use, smoking, history of benign breast disease, alcohol intake, postmenopausal hormone use, age at first birth, and parity. The association between red meat intake and breast cancer risk was modified by oral contraceptives. For each serving/day of total red meat, the risk of breast cancer was 54% higher among women who currently used oral contraceptives (relative risk 1.54, 1.13 to 2.08) and 11% higher in women who were former users (1.11, 1.02 to 1.22), with no association in non-users (1.04, 0.84 to 1.28) (P for interaction=0.007); the interaction was also significant among premenopausal women (P for interaction=0.009). We found that higher consumption of red meat in women during early adulthood was associated with a higher risk of breast cancer. Adjusting for animal fat, fruits and vegetables, and heme iron did not appreciably change the association between red meat intake and breast cancer risk. Moreover, poultry intake was associated with a lower risk of breast cancer in postmenopausal women. Although intakes of legumes, fish, eggs, and nuts were not significantly associated with breast cancer in either premenopausal or postmenopausal women, substituting legumes or poultry or the combination of poultry, fish, legumes, and nuts for red meat was associated with a lower risk of breast cancer. In addition, higher intakes of total iron or heme iron were not associated with risk of breast cancer. The evidence from prospective studies concerning a role of red meat intake during adulthood in risk of breast cancer is not consistent.3 5 7 8 A recent review and meta-analysis of prospective studies on consumption of unprocessed and processed red meat and breast cancer incidence found that the intake of the red meat was not independently associated with increasing breast cancer risk.4 However, most of the results have been derived from diet during midlife and later, and red meat intake during early adulthood may be more related to an increased risk of breast cancer. Carcinogenic byproducts such as heterocyclic amines and polycyclic aromatic hydrocarbons, created during high temperature cooking of meat; animal fat and heme iron from red meat; and hormone residues of the exogenous hormones for growth stimulation in beef cattle are some of the mechanisms that may explain the positive association between high intake of red meat and risk of breast cancer.23 24 25 26 27 28 We had only limited information on cooking methods of red meat. Controlling for the frequency of fried foods at home and away from home in this analysis did not alter the results. Furthermore, our findings persisted after adjustment for heme iron or total fat, thus reducing the possibility that they were due to higher intake of heme iron and fat. Potential limitations need to be considered. Because the participants were predominantly white, educated US adults, we cannot determine whether our findings are generalizable to other race or ethnic groups; however, race/ethnic specific risk factors for breast cancer have not been documented. Because dietary intake was assessed by food frequency questionnaires, some degree of measurement error is inevitably present, and thus to reduce measurement error we used the cumulative average of multiple measurements in a sensitivity analysis. Residual confounders are always of concern in any observational studies. Although we adjusted for a wide range of potential confounders for breast cancer, we still could not rule out the possibility that other unmeasured or inadequately measured factors have confounded the true association. We indirectly estimated the effects of substitution of legumes, poultry, and other protein sources for red meat on risk of breast cancer. Although trials on dietary modification would be ideal to support these substitutions, trials with sufficiently large sample sizes, long follow-up, and adequate compliance are not feasible. In addition, we made multiple comparisons (different food groups and nutrients, premenopausal and postmenopausal subgroups, and subtype of tumors) in this analysis, and we cannot exclude the possibility of type I errors. However, the central finding of an association with red meat was a prior hypothesis. The strengths of this study include the large number of cases, length of follow-up, and ability to examine subtypes of breast cancers. The detailed prospective and updated assessments of diet and lifestyle factors allowed adjustment for many potential confounders. Recall bias would not be present because the study was strictly prospective and dietary assessment was conducted on all participants before the diagnosis of breast cancer. This analysis supports an association between higher consumption of total red meat during early adulthood and increased risk of breast cancer that was not clearly restricted to breast cancers in premenopausal women. Although the association was not significant in postmenopausal women alone, this may be due to lower statistical power in that group so we are not able to say with confidence that there is no association. In the current study, each serving per day increase in red meat was associated with a 13% increase in risk of breast cancer. When this relatively small relative risk is applied to breast cancer, which has a high lifetime incidence, the absolute number of excess cases attributable to red meat intake would be substantial, and hence a public health concern. Moreover, higher consumption of poultry was related to a lower incidence of breast cancer in postmenopausal women. Consistent with the American Cancer Society guidelines,35 replacement of unprocessed and processed red meat with legumes and poultry during early adulthood may help to decrease the risk of breast cancer. Further study of the relation between diet in early adulthood and risk of breast cancer is needed. We thank the participants and staff of the Nurses’ Health Study II; the following state cancer registries for their help AL, AZ, AR, CA, CO, CT, DE, FL, GA, ID, IL, IN, IA, KY, LA, ME, MD, MA, MI, NE, NH, NJ, NY, NC, ND, OH, OK, OR, PA, RI, SC, TN, TX, VA, WA, WY; and the Connecticut Department of Public Health Human Investigations Committee, which approved this study. Certain data used in this publication were obtained from the Department of Public Health. Contributors: MSF, EC, WYC, AHE, and WCW designed the research. MSF carried out the analysis and wrote the manuscript. All authors provided critical input in the writing of the manuscript and read and approved the final version of manuscript. MSF and WCW are the guarantors. Funding: This study was supported by the National Institutes of Health grant (R01CA050385). The study sponsors were not involved in the study design and collection, analysis, and interpretation of data, or the writing of the article or the decision to submit it for publication. The authors were independent from study sponsors. Competing interests: All authors have completed the ICMJE uniform disclosure form at www.icmje.org/coi_disclosure.pdf (available on request from the corresponding author) and declare: no support from any organization for the submitted work; no financial relationships with any organizations that might have an interest in the submitted work in the previous three years, no other relationships or activities that could appear to have influenced the submitted work. Ethical approval: The study protocol (institutional review board No 1999-P-003389) was approved by the institutional review boards of Brigham and Women’s Hospital and Harvard School of Public Health. The completion of the self administered questionnaire was considered to imply informed consent. Transparency: MSF and WCW affirm that the manuscript is an honest, accurate, and transparent account of the study being reported; that no important aspects of the study have been omitted; and that any discrepancies from the study as planned (and, if relevant, registered) have been explained. Levine ME, Suarez JA, Brandhorst S, Balasubramanian P, Cheng CW, Madia F, et al. Low protein intake is associated with a major reduction in IGF-1, cancer, and overall mortality in the 65 and younger but not older population. Cell Metab2014;19:407-17. Weroha SJ, Haluska P. The insulin-like growth factor system in cancer. Endocrinol Metab Clin North Am2012;41:335-50. Alexander DD, Morimoto LM, Mink PJ, Cushing CA. A review and meta-analysis of red and processed meat consumption and breast cancer. Nutr Res Rev2010;23:349-65. Genkinger JM, Makambi KH, Palmer JR, Rosenberg L, Adams-Campbell LL. Consumption of dairy and meat in relation to breast cancer risk in Black Women’s Health Study. Cancer Causes Control2013;24:675-84. Cho E, Chen WY, Hunter DJ, Stampfer MJ, Colditz GA, Hankinson SE, et al. Red meat intake and risk of breast cancer among premenopausal women. Arch Intern Med2006;166:2253-9. Pala V, Krogh V, Berrino F, Sieri S, Grioni S, Tjønneland A, et al. Meat, eggs, dairy products, and risk of breast cancer in the European Prospective investigation into Cancer and Nutrition (EPIC) cohort. Am J Clin Nutr2009;90:602-12. Ferrucci LM, Cross AJ, Graubard BI, Brinton LA, McCarty CA, Ziegler RG, et al. Intake of meat, meat mutagens, and iron and the risk of breast cancer in the Prostate, Lung, Colorectal, and Ovarian Cancer Screening Trial. Br J Cancer2009;101:178-84. Land CE, Tokunaga M, Koyama K, Soda M, Preston DL, Nishimori I, et al. Incidence of female breast cancer among atomic bomb survivors, Hiroshima and Nagasaki, 1950-1990. Radiat Res2003;160:707-17. Swerdlow AJ, Barber JA, Hudson GV, Cunningham D, Gupta RK, Hancock BW, et al. Risk of second malignancy after Hodgkin’s disease in a collaborative British cohort: the relation to age at treatment. J Clin Oncol2000;18:498-509. Wahner-Roedler DL, Nelson DF, Croghan IT, Achenbach SJ, Crowson CS, Hartmann LC, et al. Risk of breast cancer and breast cancer characteristics in women treated with supradiaphragmatic radiation for Hodgkin lymphoma: Mayo Clinic experience. Mayo Clin Proc2003;78:708-15. Nutrient Database for Standard Reference, release 14: Department of Agriculture ARS, 2001. Holland GWA, Unwin ID, Buss DH, Paul AA, Dat S. The composition of foods. Royal Society of Chemistry and Ministry of Agriculture, Fisheries and Food, 1991. Dial S. Tocopherols and tocotrienols in key foods in the US diet. AOCS Press, 1995:327-42. Willett W, Stampfer MJ. Total energy intake: implications for epidemiologic analyses. Am J Epidemiol1986;124:17-27. Willett WC, Howe GR, Kushi LH. Adjustment for total energy intake in epidemiologic studies. Am J Clin Nutr1984;65:1220-8S; discussion 1997;1229-1231S. Colditz GA, Stampfer MJ, Willett WC, Stason WB, Rosner B, Hennekens CH, et al. Reproducibility and validity of self-reported menopausal status in a prospective cohort study. Am J Epidemiol1987;126:319-25. Halton TL, Willett WC, Liu S, Manson JE, Stampfer MJ, Hu FB. Potato and French fry consumption and risk of type 2 diabetes in women. Am J Clin Nutr2006;83:284-90. De Stefani E, Ronco A, Mendilaharsu M, Guidobono M, Deneo-Pellegrini H. Meat intake, heterocyclic amines, and risk of breast cancer: a case-control study in Uruguay. Cancer Epidemiol Biomarkers Prev1997;6:573-81. Steck SE, Gaudet MM, Eng SM, Britton JA, Teitelbaum SL, Neugut AI, et al. Cooked meat and risk of breast cancer lifetime versus recent dietary intake. Epidemiology2007;18:373-82. Lauber SN, Ali S, Gooderham NJ. The cooked food derived carcinogen 2-amino-1-methyl-6-phenylimidazo[4,5-b] pyridine is a potent oestrogen: a mechanistic basis for its tissue-specific carcinogenicity. Carcinogenesis2004;25:2509-17. Farvid MS, Cho E, Chen WY, Eliassen AH, Willett WC. Premenopausal dietary fat in relation to pre- and post-menopausal breast cancer. Breast Cancer Res Treat2014;145:255-65. Kallianpur AR, Lee SA, Gao YT, Lu W, Zheng Y, Ruan ZX, et al. Dietary animal-derived iron and fat intake and breast cancer risk in the Shanghai Breast Cancer Study. Breast Cancer Res Treat2008;107:123-32. Andersson AM, Skakkebaek NE. Exposure to exogenous estrogens in food: possible impact on human development and health. Eur J Endocrinol1999;140:477-85. Aune D, Chan DS, Greenwood DC, Vieira AR, Rosenblatt DA, Vieira R, et al. Dietary fiber and breast cancer risk: a systematic review and meta-analysis of prospective studies. Ann Oncol2012;23:1394-402. Buck K, Zaineddin AK, Vrieling A, Linseisen J, Chang-Claude J. Meta-analyses of lignans and enterolignans in relation to breast cancer risk. Am J Clin Nutr 2010;92:141-53. Thompson MD, Mensack MM, Jiang W, Zhu Z, Lewis MR, McGinley JN, et al. Cell signaling pathways associated with a reduction in mammary cancer burden by dietary common bean (Phaseolus vulgaris L.). Carcinogenesis2012;33:226-32. Carruba G, Granata OM, Pala V, Campisi I, Agostara B, Cusimano R, et al. A traditional Mediterranean diet decreases endogenous estrogens in healthy postmenopausal women. Nutr Cancer2006;56:253-9. Thompson MD, Thompson HJ. Physiological effects of bean (Phaseolus vulgaris L.) consumption on cellular signaling in cancer. Cell Cycle2012;11:835-6. Zheng JS, Hu XJ, Zhao YM, Yang J, Li D. Intake of fish and marine n-3 polyunsaturated fatty acids and risk of breast cancer: meta-analysis of data from 21 independent prospective cohort studies. BMJ2013;346:f3706. Kushi LH, Doyle C, McCullough M, Rock CL, Demark-Wahnefried W, Bandera EV, et al. American Cancer Society 2010 Nutrition and Physical Activity Guidelines Advisory Committee. American Cancer Society Guidelines on nutrition and physical activity for cancer prevention: reducing the risk of cancer with healthy food choices and physical activity. CA Cancer J Clin2012;62:30-67.